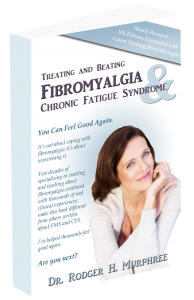 Dr. Rodger Murphree Can Help You Treat And Beat Your Fibromyalgia | Your Fibro Doctor - You don’t have to live with fibromyalgia! 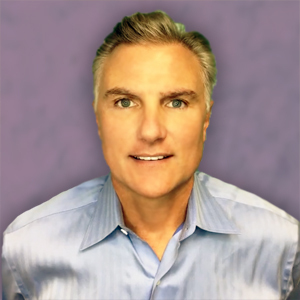 Dr. Rodger Murphree is the founder and past clinic director for a large integrated medical practice located in Birmingham, Alabama. The practice was staffed with board-certified medical doctors, chiropractors, acupuncturists, and nutritionists who combined traditional and alternative medicine. The clinic provided cutting-edge treatments for acute and chronic illnesses. He has specialized in difficult-to-treat patients for the last 10 years. He is a graduate of the University of Alabama Birmingham (UAB) and is a board certified chiropractic physician. In 2002, Dr. Murphree separated from his medical clinic so that he could open his own practice in Birmingham, Alabama. He maintains a busy practice focusing on fibromyalgia, chronic fatigue syndrome, cardiovascular disease, mood disorders, and other difficult to treat illnesses. He consults with other physicians, lectures throughout the United States giving educational seminars to patients and healthcare professionals, is a regular columnist for numerous publications, and routinely appears on national radio broadcasts. Dr. Murphree’s books are available at most books stores, Amazon.com, or here on our online store. Most doctors, if they believe fibromyalgia exists, and many still don’t, simply don’t understand fibromyalgia. They’ll tell you to get more sleep, exercise, and lose weight. You’d love to get a good night’s sleep but haven’t had one in years. And for some, you’d like to lose weight, but no matter what you eat or don’t eat you continue to gain weight. And forget about exercise, you have a hard enough time getting out of bed to face each day. Finding a doctor who understands your pain, fatigue, poor sleep, irritable bowel symptoms, brain fog, and growing list of problems can be hard. Finding one that can actually help you feel good again, is even harder. Most doctors just don’t get it. I’ve specialized in treating and beating fibromyalgia for almost two decades. I understand what you are going through. I know you hurt, have no energy and are struggling to find answers. I know you just want to feel good again. For almost two decades I’ve specialized in helping my fibromyalgia patients feel good again. I’ve learned the hard way, that drug therapy alone is a dead end, at least long term. The usual approach of prescribing drugs to cover up symptoms just doesn’t work. For those with fibromyalgia, there are just too many symptoms. A drug to put you to sleep, a drug to wake you up, a drug to speed you up, a drug to calm you down-drugs for pain, depression, and then drugs for side effects from the growing list of drugs. It just never ends. 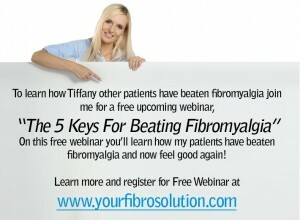 You can’t drug your way out of fibromyalgia. I’ve learned that each patient that suffers with fibromyalgia has a unique experience, one that is often different from other patients with fibromyalgia syndrome. There isn’t a one-size fits all approach that works for fibromyalgia. And it can’t be treated piecemeal. The only way to beat fibromyalgia and feel good again is to get healthy. Drugs don’t make you healthy. They can be helpful and sometimes they are your only or best option, but they don’t make you healthy. I help my patients feel good again. They get healthy and stay healthy. Unlike some doctors who may say they treat fibromyalgia, I specialize in treating fibromyalgia and have done so for the last twenty years. And not only do I have twenty years experience treating beating fibromyalgia, I have the positive results and patient transformations to prove it. I do the needed detective work, going beyond the usual lab tests to find and fix the underlying causes of fibromyalgia. I then use my clinically proven, scientifically sound, all natural therapies—high doses, but the right doses and combinations of vitamins, minerals, amino acids, diet, and natural nutraceuticals to help my patients get well and stay well. Many of my patients share their success story of how getting healthy and feeling good again in my book and here on this site. Please take time to listen to or read their stories by clicking here. Whether you are more of a visual person or you do better in a conversational environment, I have several free resources for you to get started with. If you find you prefer to read, you can take advantage of my book Treating and Beating Fibromyalgia & Chronic Fatigue. This eBook is normally $14.95, however, you get the first 3 chapters for free simply by being in the right place. Click here to sign up for this free gift! Click here to take a look at the weekly blogs. There is a wealth of timely information in the blog articles. 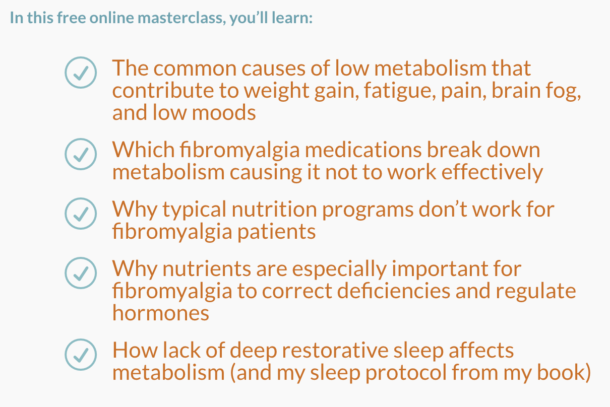 Additionally, I have a free Treating and Beating Fibromyalgia webinar where you’ll find answers many of the questions you may have, including how you can get the same health restoring results my patients have gotten. Click here to sign up for the webinar. The only way to feel good again is to get healthy. I offer customized programs that help you get healthy and stay healthy. 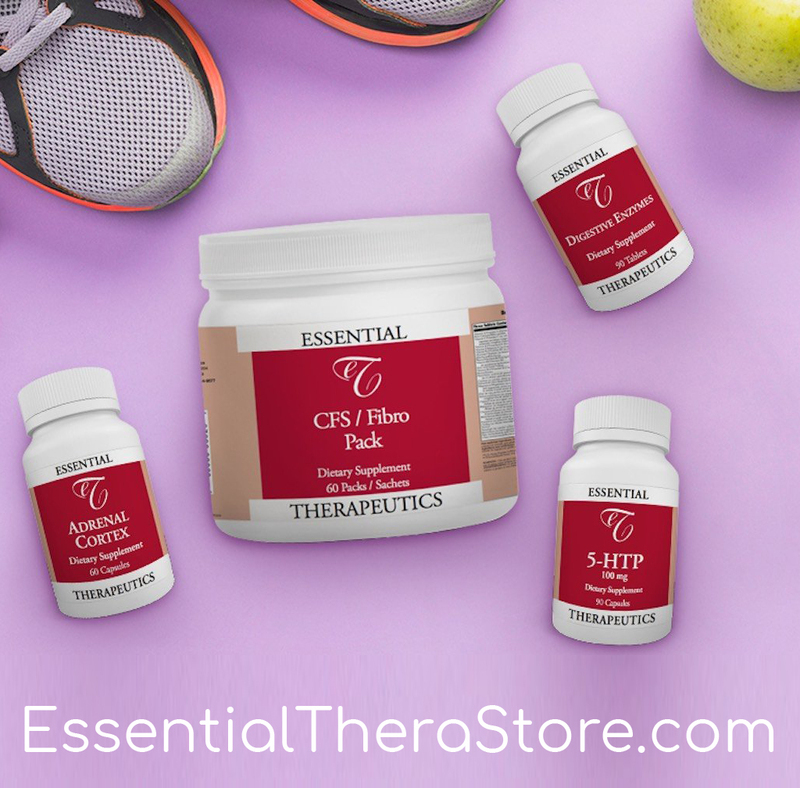 These programs uncover the causes of your underlying issues and then use customized nutritional therapy and diets to get you sleeping through the night, drastically reduce your pain, and boost your moods, metabolism, energy, and mental clarity. The goal is to get you healthy and have you stay healthy. In short, you have access to several resources to get started on your journey towards better health. However, you may find that you need additional help in your quest to get healthy and feel good again. If you’ve tried to do the research on your own, taken numerous drugs or supplements, and perhaps even worked with a variety of doctors and still don’t feel good, then it is time to set up a new patient consult with me. Or maybe you’re just sick and tired of being sick and tired and you want to feel good as quick as possible. If so then a new patient phone consult is your best option. During this consultation, I will determine if I can help you, decide the best course of action, and outline your best options. For many, this is your first step toward a new life—one free of pain and fatigue. You can call the clinic 205-879-2383 or sign up for a new patient consult here.